This is actually a nice enhancement of the old “touch to focus”. You now get the option with a new circular, on screen control that can be dragged by your finger around the viewfinder to adjust a photo’s focus and exposure. Of course, we are not talking about professional photography. For most Moto X owners, this can be very handy because you are not forced to focus on the center, and the old touch to focus sometimes does not work as expected..
Smartphone is more than a phone. Now a lot of Moto X owners use the device to read books, browse webpages, play games and watch movies or TV episodes. Full-screen mode is often desired. But the old full-screen model does not give a full full-screen. The notification bar, the soft keys may still occupy some regions. So, the usable screen size are not maximized. And you may accidentally tap the wrong buttons/locations. With Android 4.4, your Moto X will automatically hide everything except what you really want to see (book, movie, game..). Just swipe the edge of the screen to bring back your status bar and navigation buttons. With every iteration of Android, you can find significant performance improvement. But some performance boosts may require updated hardware. Android 4.4 (KitKat) changed this. Android 4.4 can run faster with less resources. The optimization of the code is quite impressive. When OS has a smaller footprint, the apps will run smoother and get more resources. As Moto X is highly optimized already, you may not be able to notice the speed improvement unless you are using some advanced tools to gauge the change. But the noticeable positive sign for most Moto X owners is slightly longer (about 10%) battery life. Surely, this depends on user’s habit. Smartphone should not be stupid. But the phone app in most smartphones looks not so smart. In Android 4.4, we finally get a smarter phone app. The new phone app automatically prioritizes your contacts based on the people you talk to the most. From the dial pad, you can also search for nearby places and businesses (for Google Play Edition only), your contacts, or people in your company. Emoji, the colorful Japanese characters, now are available on the default Google Keyboard. You can use Emoji in text messages and other communications from Moto X.
Android 4.4 supports closed captioning and subtitles. The Gallery app in Moto X is also updated to Android KitKat one. Some new photo editing options, e.g., new filter effects, draw on your photos, advanced cropping, adjustments to color, exposure, contrast, are added to Moto X. Now, you probably does not need any other photo editing tools any more. For the touchless control, a new “Find my phone” command is added. Once you say “OK, Google Now-find my phone”, your Moto X will ring loudly to let you know where it’s hiding. Of course, your Moto X should be nearby to hear the command. Accessing files in the phone, and accessing the file in the Google drive, are almost identical for Quickoffice now. Once creating or modifying files, you can choose to save them in the local storage or in the cloud directly. No other apps or windows to open. More apps and cloud storage services will join the league soon as the SDK is open to all developers. 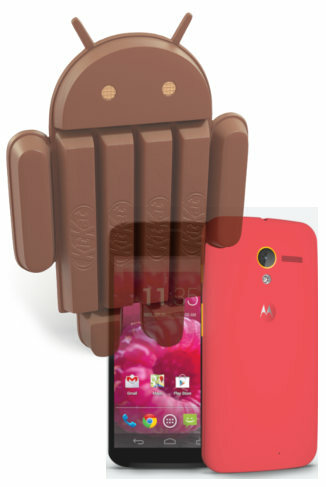 How do you like the Android $.4 (KitKat) update for your MotoX? Share with other Moto X Owners in the comment box below. I wonder if I can upgrade my Samsung S4? or not yet? Samsung Galaxy S4 just got 4.3 update, and there are a lot of problems reported on the Android 4.3 update for Galaxy S4. For Android 4.4 update for Galaxy S4 will arrive in Q1 2014. Thanks for this step-by-step instruction. It was really helpful! I’m trying to use emojis on my moto x. Are they only available on hangout? I installed the emojis in English add on, but they still are not showing up on my keyboard. You need use the stock keyboard. It is not necessary to install anything else. Emojis can also be sued in QuickOffice…., not just SMS and email. Now update your calendar so I can sync my Ical to my smartphone without have to login to Google. I don’t want to use my google login, but rather my computer login. HELP!!!!!! Phone numbers are no longer associated with my contacts in the phone app. This means i don’t know who is calling. Ever. Any way to fix this? did you try to reboot your Moto X to see whether it works? Yes, I tried rebooting, but it still isn’t working correctly. Harry, you have to remove the Google account entirely and then add it back. I used to have the same problem. Por qué cresta te encontré acá…?! Hahahahahha thanks for the advise, I did not try that because I formated the phone before hand, which works also (obviously since the trick was that). Ever since the update last night my email is VERY slow to load (if it does) and normally has to be refreshed manually even though it’s set on 15 minutes. I am new to the touchscreen world but do not like the new dial pad screen at all. I prrefer to have the slide screen as before with the bigger pad, recent calls and contacts. Noisy in my diesel truck and the voice command don’t always work good. Not very happy right now since I just bought it two days before the update. For the email, you can go to settings–apps, clear the cache and try again. Also, normally after the major update, it is a good practice to do factory reset. Of course, you must backup your data as the reset will erase all your data. Thanks, Simon, I will have to figure out how to do a full backup, don’t have the time to research it all right now. Unfortunately, Motorola is no longer providing backup solutions. Motocast doesn’t work with Moto X. To backup contacts, you can simply merge with Google (contacts – – menu – – merge contacts – – merge with Google). You can also use some free apps to do the job. For sms, you can use some free apps. For photos or videos from you camera, you can automatically backup them to G+. Do the emojis oy work while sending a text? When I try to use them on twitter or Instagram the emoji keyboard option isn’t there. Help. Usually emojis are only used for messages. Google keyboard may hide them if it knows emojis should not be used. If you want to use emojis anyway (the result depends on apps), you can try SwiftKey, which allows emojis in all apps. For Google keyboard, you cannot manage it. Of course, you can reset the keyboard by clearing cache and clearing data for it in settings – apps. But this will reset all your keyboard settings. Which apps we have to clear the cach. And data, apps name pls…..